Schalke 04 faces Hannover 96 in a match from the 10th round of the German Bundesliga. Let’s take a look at this clash at the Feltins-Arena in the city of Gelsenkirchen. Schalke are having a pretty bad start of the new season. The Royal Blues are 15th in the current standings, just one point above the 16th Hannover 96 and the relegation playoff spot. So far Schalke have just 7 points won and a pretty mediocre record of 2 wins, 1 draw and 6 losses. In their previous game Schalke made their first draw for the new season. Domenico Tedesco’s team travelled to Leipzig and made a 0-0 draw with RB Leipzig. Both teams had some chances to score a winner, but in the end the game ended without any goals being scored. Last season Schalke finished 2nd and qualified for the Champions League, but now it’s absolutely unexplainable why the team is at this level. Hannover 96 are one position under Schalke in the standings, being 16th with 6 points won. As it looks right now, Andre Breitenreiter’s team will be locked in a fight against relegation. In their last five games Hannover 96 lost three times, including against Augsburg at home in the previous fixture. Ihlas Bebou scored for Hannover at the HDI-Arena, but this goal was not enough for at least a point in the match. In this match Schalke can’t use the suspended Hamza Mendyl, while Cedric Teuchert is injured. Meanwhile Ralf Fährmann, Sascha Rietner and Bastian Oczipka are doubtful for the next match. Hannover 96 can’t use the injured Timo Hubers and Edgar Prib, while Takuma Asano, Michael Esser, Pirmin Schwegler and Niclas Füllkrug could miss the match because of their recovery. 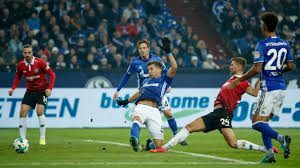 That’s our look at the Schalke 04 and Hannover 96 at the Veltins-Arena. Good luck!